Since I don’t want to haul all of those magazines from one house to another, I’ve been trying to scan through a few of them here and there when I have a few minutes. In doing so I’ve discovered some great recipe ideas. These bruschetta melts were the first on the list to get recreated! As soon as I saw them, I knew that I wanted to create a version of my own. 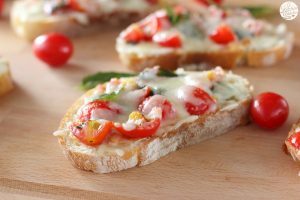 We love bruschetta, and I was intrigued by the use of cream cheese. Let’s just say that it won’t be the last time I use cream cheese when making bruschetta. 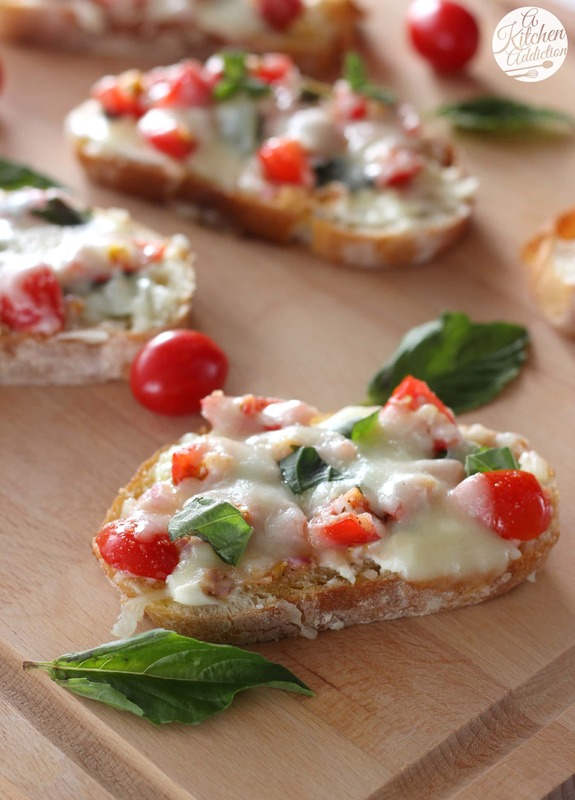 The layer of cream cheese gives the bruschetta melts a rich, creamy flavor. Plus, it keeps the bread from getting soggy if they sit for awhile! The fresh, bright flavors of tomato and basil make these a great addition to your next summer party. I’ve made the tomato mixture ahead of time and let it refrigerate until I’m ready to use it. That way the assembling of the bruschetta melts ends up taking no time at all. We’ve had these as appetizers and even turned them into a meal on a lazy Saturday! In a small bowl, whisk together olive oil, salt, pepper, and minced garlic. Stir in tomatoes and onion until combined. Set aside. Spread cream cheese over the tops of the french bread slices. Place on prepared baking sheet. Top with tomato mixture. Sprinkle with torn basil leaves. Top with mozzarella cheese. Bake for 8-10 minutes, or until cheese is melted. Because the size of a loaf of french bread varies, you may find yourself using more or fewer pieces of french bread to use up the tomato mixture. 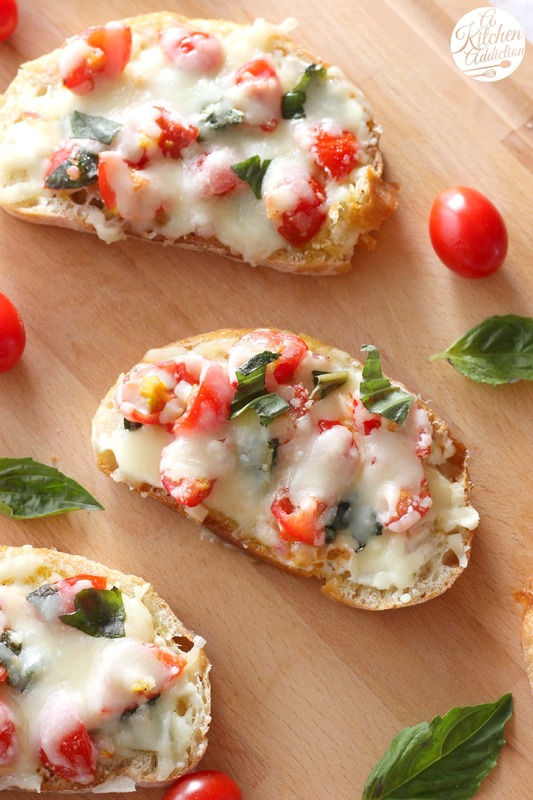 ohhh this bruschetta looks delicious!I love that melty cheese! Oh my, these look delicious. I love bruschetta. Pinned! Perfect for summer. When I was subscribing to a few food magazines, I couldn’t keep up! So I had lots of unread ones too, but I think I did the same thing you did, scan through them for a few good recipes! These melts look delicious! YUM! These look so tasty. Another with mozzarella, tomatoes and basil is #winning this time f year. Bruschetta & cheese are two of my favorites… this is the perfect appetizer with a glass of wine! For a long time, I was so good about clipping out recipes from magazines that I wanted to make and then throwing out the rest…but not lately! Need to get back to that. These melts look like the perfect easy summer meal! Oh gosh I’m so bad with food magazines! I have piles of them everywhere that I really need to go through and get rid of what I don’t want! These melts sound so good! Making me hungry for dinner! These look so gooey and delicious! Love the cream cheese! These look heavenly! Melty cheese was the only thing bruschetta was missing and you nailed it 🙂 Pinning! I feel like my cooking magazines multiply themselves. I’ll get rid of a bunch of them and then a few months later I feel like I’m drowning in them again! 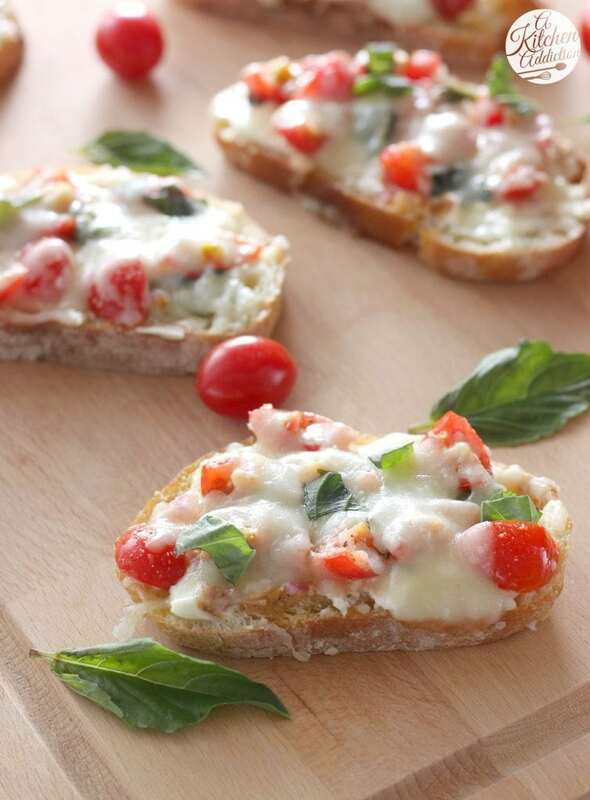 Bruschetta with cream cheese sounds so delicious! I lvoe looking through those magazines that somehow get hidden through time. I’m glad you’ve been searching through them and found some keepers – these bruschettas are definitely keepers, too! I love when I discover old recipes! I would definitely make a meal out of this bruschetta! So many good flavors! Ooooo cream cheese + bruschetta = ahhh sold! This is such a great idea! Love this for easy weekday lunches! Yum! Talk about the perfect appetizer! These look so great! I have a real thing for bruschetta and a serious love of cream cheese. Can’t wait to try them! I love bruscetta is an appetizer, or even dinner, in the summer when I want to whip up something fast. awesome!